Oxygen is blown on the hot metal in the converter during steel making for removal of impurities such as carbon, silicon, manganese and phosphorus etc. In the 1950s when the top blown converter size was limited to 50t maximum then a single hole lance was being used for the oxygen blowing. With the passage of time the converter size went on increasing. This has necessitated increase of number of holes in the lance for better distribution of oxygen over a larger surface of the bath in the converter. Today 5-6 holes lances are very common. Even 8 holes lances are under use. The axes of ach of the nozzles in a multi hole lance are typically inclined at around 10 deg with respect to the lance axes. 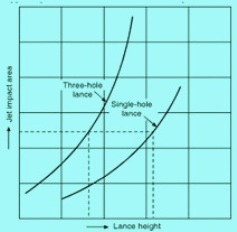 Fig 1 shows schematically the increase in jet impact area on the bath for a three holes lance when compared with a single hole lance. Oxygen lance is subjected to the heating load in the converter from radiation, convection and conduction. It is subjected to continuous corrosion by high temperature slag and splashing. Further during the converter blowing molten slag particles gets solidified on the lance surface and sticks to the lance. These slag particles impact the transfer of heat to the lance. The CD nozzle is also known as laval nozzle and is characterized by a flow passage whose cross sectional area decreases in the direction of the flow, attains a minimum cross section area and then increases further in flow direction. The minimum cross section area of the flow passage is called the throat of the nozzle. The laval nozzle design helps in accelerating the gas velocity to the supersonic velocities. The gas flow jet is sub divided into potential core, supersonic and subsonic regions. Within the core region the velocity is constant. At the end of supersonic region the velocity becomes Mach 1. Downstream the velocity is sub sonic. The jet interacts with the converter environment and produces a region of turbulent mixing. The entrainment process increases the mass flow rate and the jet diameter and decreases the mean axial velocity as the distance from the nozzle exit increases. The impact force on the slag melt surface is reduced with increasing lance height. The jet length and the spreading angle are affected by the gas temperature and pressure as well condition of metal slag mix in the converter. Single hole lance tip – Design of laval type single hole lance tip nozzle is simple. It comprises of contracting section, throat opening and expanding section. At the throat section which is at the inter section of the contracting and expanding sections, the cross section area is smallest. Throat opening diameter is the critical diameter and the area at the throat is the critical area. Presently single hole lance tips are no more under use. Multi holes lance tips – Multi holes lance tips can contain from three number laval type nozzles to nine number laval type nozzles. These lances are at angle to centre line of the lance. Four holes to six holes lances are more popular. These lances produce multiple strand supersonic jet at the nozzle outlet. Metallurgical process performance of these lance tips is very superior. However manufacturing of these lance tips is more complex. Normally components of these lance tips are manufactured separately and then assembled and welded. In this way the manufacturing is easy, dimensions are accurate and the operating performance is good. However for longer life of these nozzles the high temperature of steels is to be avoided, there is to be good slagging and low position blowing is to be avoided. Multi holes lance tips are most popular in converter steel making today. The following are the important parameters in the design of multi holes lance tips. A lance tip and cross section of lance tip is shown in Fig. 2.
ii) It should have efficient cooling. v) It should have a precision engineered design to have the specific oxygen flow.